At the north end of the causeway is this entrance into the village. This way leads to the 月沼 Yuezhao (Crescent lake). The girls in the back are tour guides. If I remember correctly, all the guides in this company are girls, which is great. 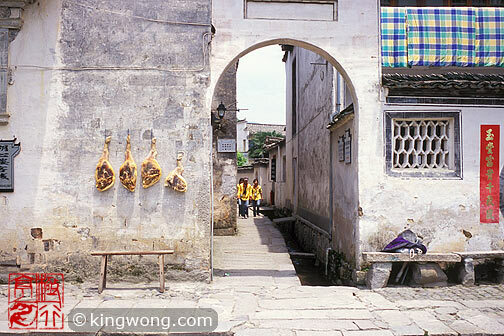 The pig legs hanging on the walls are a popular food of the villages in the area. Every household makes them. I tasted them while I was in 南屏 Nanping village. There, a woman offered a bowl of noodle with a few chunks of the meat in it. I don't think the woman's cooking did justice to the pig meat.